The ISO # is an international standard that should make cameras, films, sensors, shutters and apertures give you the correct exposure. We know that your exposure determines the shadow areas of your negative, development determines the contrast. Exposures can be divided up into steps of tone from black to white or clear film to dense film. These steps (zones) are broken up into divisions of one "stop" of exposure. This is often refered to as changes in film densities. Meters (and ISO) are designed to give a middle gray exposure. true for your meter and film. If necessary we can correct this by simply setting our meter to a "custom" iso. This test is simply metering a test target and bracketing exposures above and below the metered settings, set to give us zone one. The target you photograph should be smooth toned, evenly lit, neutral in color and large enough to fill the frame. Set your meter to the manufacturers film speed (iso#) or ASA. Point your camera at the subject and set the lens and shutter to give the recommended exposure. 1- Make your first exposure at this camera setting ~ this will be middle gray Zone 5.
on the film)tone above clear film. This frame indicates your calibrated film speed for your camera, lens and meter. film speed recommended by the manufacturer. Try to consider design, look for good lighting, shadows, fill the frame. 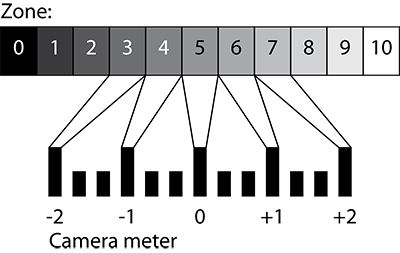 After shooting the film test in class, the remainder can be shot in any order- indicate the frame number in the box. Indoor shots may need a tripod or other camera support.